It´s summer time and nothing is better than whipping up your own delicious creamy ice cream. 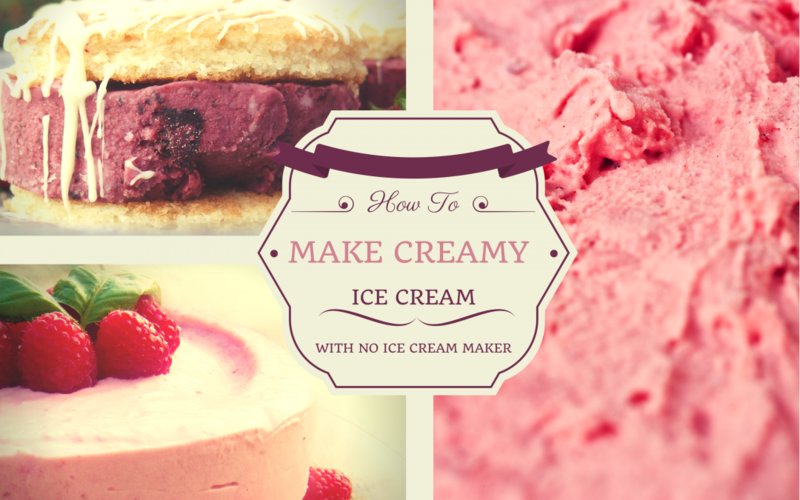 Some of you might think that doing homemade ice cream is hard simply because you don´t have an ice cream maker. At least that’s what I used to think until I discovered how to make it without an ice cream maker. Personally, I want my ice cream to have a rich and creamy texture, not too icy although remaining easy and fairly quick to prepare. Here you will find the secret formula to easily prepared creamy ice cream without using an ice cream maker. There are many kinds of ice cream bases. Mine includes cream, quark cheese (also called farmer’s cheese) and corn starch. Corn starch acts as an emulsifier keeping the ice crystals at bay. Because berries are essentially composed of water and all their water leads to extra ice crystals. Using eggs instead of corn starch would also be a good emulsifier but what corn starch does (that eggs do not) is to soak up the water (making it suitable for fruit based ice creams). I used heavy cream to give the ice cream a luscious mouth feel and quark to give it a smoother and more round feel than it would by only using cream. During my brief ice cream research I also found out that using alcohol in ice cream was a good way to prevent home made ice cream to become so incredible hard when frozen. So because I want a nice soft scoop (without the feel of cutting through stone) I added just a little alcohol just to prevent it from getting too hard when frozen. So now you’ve got the secret formula to prepare a delicious fruit ice cream but here is one more thing to keep in mind. One of the biggest keys to success is keeping everything very cold which is why I like to use frozen berries in my ice cream also having the advantage of making the process a tad faster. Make sure to store your ice cream in the very back of the freezer, as far away from the door as possible. Every time you open your freezer you let in warm air. Every time ice cream increases in temperature, some of the ice crystals trapped inside melt and when frozen again larger crystals are created. Good luck! 1-2 tbsp Liquor (I used white rum, but you can easily substitute it with vodka if you´re not fond of the rum taste). In a small pot, simmer 1 cup of cream and sugar until sugar completely dissolves. In a separate bowl, mix corn starch with the remaining cream. Stir with a fork until corn starch is completely dissolved. Add cornstarch mixture with the cream and the sugar gradually, whisking constantly. Cook and stir over medium heat until it starts to thicken and barely reaches a boil, about 5 minutes. Immediately reduce heat to low and stir until thick. Transfer cream to a freezer safe bowl and put in freezer to chill for a few minutes. 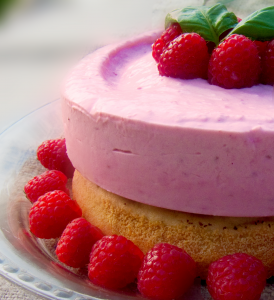 In the mean time mix the frozen Raspberries with a hand blender in a large bowl until smooth. Stir in the quark and the liquor with the corn starch cream, blend well until everything comes together. Stir in the mixed raspberries and blend well. Transfer mix to a 8-inch round non-stick cake pan or similar, and put in the freezer.